Should we also include the occasional oddity like "Love Songs"? I hadn't planned to just because all those songs are spread out on other albums, unlike the past master songs. I was thinking the same. Then there are things like the original "Rarities" album, and the "Anthology" sets. And then there's the Star Club tapes. "Norwegian Wood (Is This Bird Ever Gonna Fly?)" The preceding albums were the countdown. Now we are BLASTING OFF!!! Rubber Soul is an album by the Beatles, their sixth UK album, and the tenth released in America. Released on 3 December 1965, it met with a highly favourable critical response and topped record charts in the United Kingdom for several weeks, as well as in the United States, where it was issued with a different selection of tracks. Produced by George Martin, Rubber Soul incorporates a mix of 1960s pop, soul, and folk music styles. The album's name comes from the term plastic soul, which popular African American soul musicians coined to describe Mick Jagger, a white musician singing soul music. It was the second Beatles album – after the British version of A Hard Day's Night – to contain only original material, and was recorded in just over four weeks to make the Christmas market. 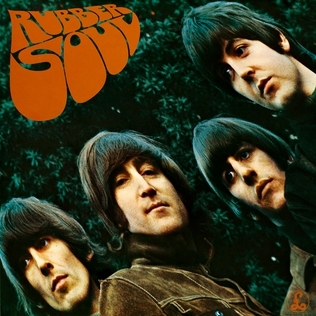 Unlike the five albums that preceded it, Rubber Soul was recorded during a continuous period, whereas the group had previously made their albums during breaks between tour dates and other commitments. The project marked the first time that the Beatles focused on creating an album as an artistic work, an approach that they then developed with Revolver (1966) and Sgt. Pepper's Lonely Hearts Club Band (1967). The album has been included in numerous "best of" album lists compiled by various publications, and is regarded by musicologists as a major artistic achievement that continued the group's artistic maturation while attaining widespread critical and commercial success. In 2012, Rubber Soul was ranked number five on Rolling Stone magazine's list of the "500 Greatest Albums of All Time". In 2013, after the British Phonographic Industry changed their sales award rules, the album was declared as having gone platinum. 13 votes gathered for 4 different songs. The field is narrowing. 5 Smilers decided that transparency was not the way to go. Per the usual, vote off your LEAST FAVORITE. This is the last easy round for me (FOURTH round going). I like Paul. I like the funky fade out. But Drive My Car is the next for me. Going to be very hard to pick a winner from this list of classics. "I'm Looking Through You" was a major loss, but my favorite is still waiting in the Top 5. Nobody is voting for it, yet. Keep it that way. 2 pixletwin: Will there be Super Survivor to decide the Ultimate Winner? Its a tie between Drive My Car and You Won't See Me. Next NEW vote for either of those wins. Call a friend. Have them vote! I'd vote against Drive My Car. Thank you bringahorse. I know how hard that was for you. 14 votes gathered for 3 different songs. The field is narrowing even further. 6 Smilers decided that we have seen the last of You Won't See Me. Per the usual, vote off your LEAST FAVORITE and decide which three tracks deserve to be in the FINAL THREE. I have been voting for the same song for 6 rounds in a row. I think that is a record for me. This is the last easy round for me (FIFTH round going). I like Paul. I like the funky fade out. But Drive My Car is the next for me. After we get through to the end of "Let It Be", are we doing the "Past Masters" set? I may slit them up and do them after major sections. ie. Past Masters Vol1 after Revolver and Vol 2 after Let it Be. In fact, volume one has so many tracks on it I was thinking of splitting into two and running them concurrently. I guess I'll vote for....hmmm.... Drive My Car? Yes. Drive My Car. Drive My Car can drive into the sunset. Great song, but doesn't hold up to that trio of Lennon classics. It's getting Hot in here. "Norwegian Wood (The Girl with the Broken Wing who just won't piss-off and Fly Away)"
to stop you from voting off his last remaining tune...have a heart pal.You are my pal, right? Paul, stop. It's not becoming. Just leave... They want the all John final. This is boring predictable if 3 John songs go to finals. Shame people don't realize Paul's greatness in simple short tunes. Simple can be genius, you know. Btw, didn't know bringahorseinhere? was serious about neighbor voting "You won't see me". Next time I'll ask smb. to vote for song I hate too. What?? That's how we lost "You Won't See Me"? My favorite Paul song on this album! That gives Rick two That's two! votes. In the future Rick needs to tell his friend to vote using their own IP Address, And after they join This Forum! Or is that what you meant when you said "Call a friend"? What kind of game are we playing here, pix? And now you get to do away with Paul's songs all together? Not cool. Does Rick get two picks in every round from now on? "Norwegian Wood"/"Norwegian Wood"/ "Norwegian Wood"/ "Norwegian Wood"/ "Norwegian Wood" If that's all it takes, a joke post, then mine should count for 5. What you let Rick do is no different than letting Watamushi do his joke post and letting it count as 5 votes. Exactly. I didn't get why bringahorse's neighbor vote was counted when he's not even Smiley member.